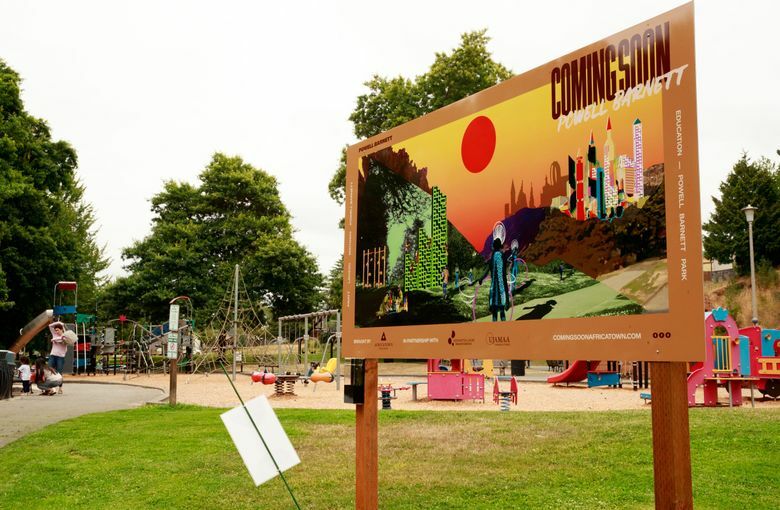 Eight large, colorful signs placed around the Central District this summer are part of an art installation that projects a vision of Seattle’s Africatown. In the rapidly gentrifying Central District, the once and future heart of Seattle’s black community, it seems almost every other street corner is home to a developer’s sign advertising a bland new town-house development or apartment building. A group of designers has imagined a different future there. It’s a utopian vision for a place called Africatown, where African-American commerce and institutions fuel the redevelopment of businesses, neighborhoods, parks and other outdoor spaces. • Gerber Park, on Martin Luther King Jr. Way, close to the intersection of MLK and Cherry streets. • Powell Barnett Park, facing MLK Way, close to the intersection of MLK and Alder Street. • Lavizzo Park, facing South Washington Street. That vision is rendered in a project called “Coming Soon,” an art installation of eight fanciful signs placed around parks in the Central District this summer. 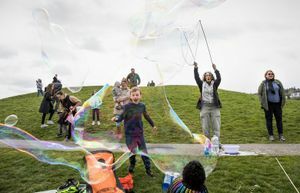 Sara Zewde, a Seattle landscape architect who works with Africatown, came up with the idea after she joined visioning exercises with the community led by Wyking Garrett, the president of Seattle’s Africatown Community Land Trust. The trust is redeveloping the key intersection of 23rd and Union in the Central District in hopes of slowing the displacement of residents from the historically black area, and encouraging more black-owned businesses. The Central District’s population was more than 70 percent black in the 1960s and early 1970s. Today, it’s less than 20 percent black, as housing prices have skyrocketed and gentrification has pushed black families out. The leaders hope Africatown could help reverse that trend. Among their goals: To help launch 100 black-owned businesses. In his visioning exercises with the community, Garrett “would ask everyone to imagine Africatown, and the descriptions were so vivid, almost like everybody was describing the same place — a parallel universe,” Zewde said. That’s how Zewde came up with the concept of signs similar to the ones developers use to advertise their future buildings, except that these signs channel the imaginings of the community. The signs burst with color and patterns. Six have been placed so far, in Gerber, Powell Barnett, Pratt and Dr. Blanche Lavizzo parks. Two more will be installed in the coming weeks. The signs will be up until mid-September. Zewde said the project team researched Afrofuturism — a movement featuring futuristic or science-fiction themes that incorporate elements of black history and culture — along with contemporary black architecture, landscape and graphic design. The background of each sign is an existing image of a property in its current state, and the designers layered images on top of it that “may look fantastical, but nothing we’re portraying in the images is outside the realm of the possible,” she said. In a sign posted at Pratt Park, black families stroll through a flower-speckled lawn, a father plays baseball with his son, and a young couple push their sleeping child in a stroller through the park. That park faces the Bryant Manor housing development, which is slated for redevelopment. The sign shows how Bryant Manor could be opened up, blurring the lines between private place and public space. In the Lavizzo Park sign, children wearing feathered headdresses parade down a pavilion of Moorish-inspired arches, playing drums, while a crowd gathers to watch. Ostriches and zebras walk through a grove of fruit trees filled with exotic birds. The sign plays on themes that are part of the Central District’s traditions now, including a drum line and a Mardi Gras celebration, Zewde said. This park is adjacent to the Seattle Vocational Institute, which is going through a revisioning process, so changes could happen there, as well. Seattle’s Africatown was inspired by Africatown, near Mobile, Alabama, founded by the last people known to have been smuggled into the United States as slaves, Zewde said. Recently, in Los Angeles, some people have started usingAfricatown to describe the area around Leimert Park, considered the region’s epicenter of African-American arts and culture. 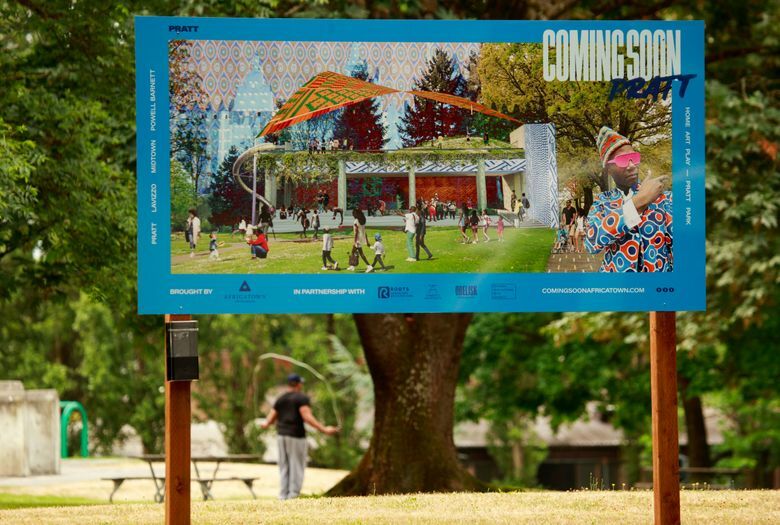 The public- art installation was funded by Arts in Parks, a partnership between Seattle Parks and Recreation and the Office of Arts & Culture. The signs are posted in Gerber Park, Powell Barnett Park, Pratt Park and Lavizzo Park, and two signs will go up later this month on the corner of 23rd Avenue and Spring Street. In addition to Zewde and Cox, the other artists are Aria Goodman, Selina Hunstiger and Daniela Rosner.